To most people, coffee has become part of its society’s culture – either having a cup of coffee to freshen up in the morning or simply just enjoying a cup with friends at the local coffee shop. As people become more familiar with coffee, its taste has today become a “lifestyle taste”. However, the recent popularity of white coffee in the market makes the coffee experience a little bit confusing. The difference between white coffee and original coffee is determined by the choice of coffee beans used in the recipe as well as the roasting process. White coffee only uses expensive Arabica coffee beans while the original black can be made with other variants of coffee beans aside from Arabica beans. In terms of roasting, this two coffee are very different as the white coffee adds a small amount of salt and butter making it smoother, less bitter and less acidic yet with authentic coffee scent compared to the black coffee that is normally roasted with sugar. ChekHup White Coffee is a Malaysian brand that creates an authentic Ipoh Malaysian White coffee in 3-in-1 instant form. They had successfully preserved the authenticity of the white coffee through their golden ratio, making your every cup of ChekHup white coffee smoother in taste and aromatic in flavor. Natural rock sugar is also used to replace white sugar to reduce the acidity of the coffee. This also plays a role in enhancing its smoothness. Without any added artificial flavoring, the coffee will not leave any strong aftertaste. 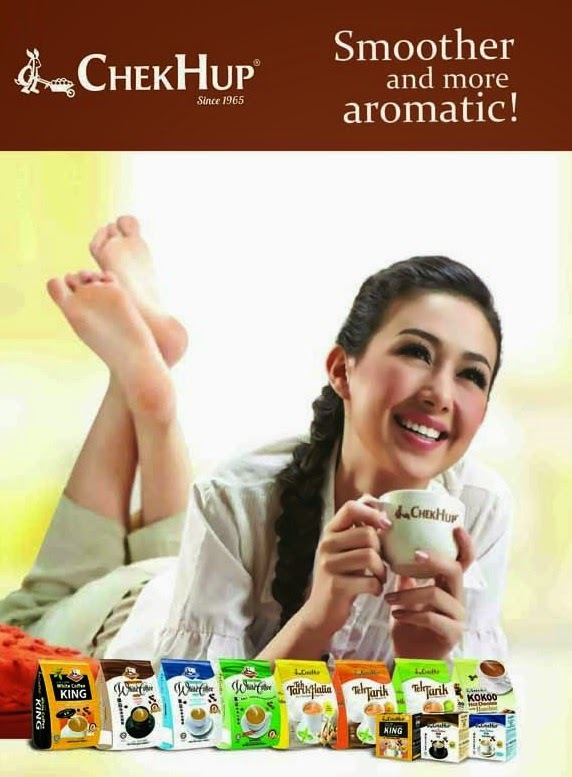 Therefore, it is believed to be one of the most authentic and premium choice of white coffee around. Aside from their White coffee series, ChekHup also offer two other beverage options, namely, Malaysian Teh Tarik which capture the authentic milk tea flavors, and Kokoo (Chocolate) which uses the world renowned Borneo’s cocoa. So whatever your tastebuds’ desire, there’s always a ChekHup series that will surely make your everyday cup filled with premium taste. ChekHup is available at leading local supermarkets namely Robinsons Supermarket, Shopwise, Puregold, S&R Unimart, Cash&Carry, Makati Supermarket and other grocery stores, oriental stores and selected Mercury Drug. In addition, you can also find and know more details about ChekHup by visiting the upcoming Philippine Marketing Association (PMA) Summer Expo set this March 5-7, 2015 at the Glorietta Activity Center. The PMA Summer Expo is an annual event that features products and service offerings of participating companies for the coming summer and this year. In addition, dance competition, educational seminars and raffle prizes await the lucky visitors of the expo. The event is managed by Ex-link Management and Marketing Services Corp. For more information and details please call tel. no. 643-3887 or email at info@exlinkevents.com.